Jessica Henderson Daniel, president of the American Psychological Association and associate professor of psychology at the Harvard Medical School, gave the keynote address. Submitted photos The Wright State School of Professional Psychology held its 37th annual commencement ceremony July 20 in the Student Union Apollo Room. FAIRBORN — The Wright State University School of Professional Psychology celebrated the graduation of 24 students at its 37th annual commencement ceremony July 20 in the Student Union Apollo Room. With the graduation of the class of 2018, the School of Professional Psychology now boasts 875 alumni serving in nearly every state and multiple countries around the world. The 24 graduates hail from eight states and three foreign countries: Canada, India and Malaysia. Thirteen members of the class earned 4.0 grade point averages. One graduate will be a psychologist at the U.S. Air Force biomedical unit and three completed internships at VA medical centers. The keynote address was delivered by Jessica Henderson Daniel, president of the American Psychological Association and associate professor of psychology at the Harvard Medical School. She told the graduates to always act with integrity. “Whatever you do, do it with integrity. People will remember what you do and how you do it,” said Daniel, who is the first African American woman to serve as president of the American Psychological Association. 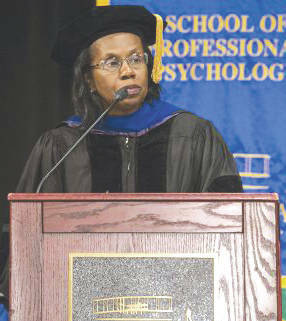 https://www.xeniagazette.com/wp-content/uploads/sites/32/2018/08/web1_sopp-graduation-20095_070-508×321.jpgJessica Henderson Daniel, president of the American Psychological Association and associate professor of psychology at the Harvard Medical School, gave the keynote address. 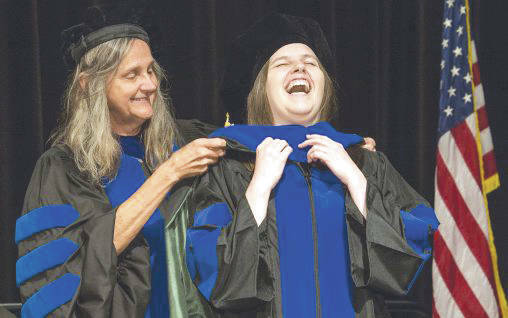 https://www.xeniagazette.com/wp-content/uploads/sites/32/2018/08/web1_sopp-graduation-20095_233-1-508×318.jpgSubmitted photos The Wright State School of Professional Psychology held its 37th annual commencement ceremony July 20 in the Student Union Apollo Room.